Ugadi comes from the word "Yuga-Aadi"
Due to the multiplicity of meanings of Sanskrit words "Yuga" means era here and "Aadi" means start. This mixture with all six tastes in Telugu and "Bevu-Bella" in Kannada, symbolizes the fact that life is a mixture of different experiences (sadness, happiness, anger, fear, disgust, surprise) , which should be accepted together and with equanimity. Later, people traditionally gather to listen to the recitation of the religious almanac (Panchangam) of the coming year, and to the general forecast of the year to come. This is the Panchanga Sravanam, an informal social function where an elderly and respected person refers to the new almanac pertaining to the coming year and makes a general benediction to all present. The advent of television has changed this routine, especially in the cities. Nowadays, people turn on the TV to watch broadcasts of the recitation. Panchaanga shravanam augurs all-auspiciousness when heard throughout the year, this has been a tested fact. 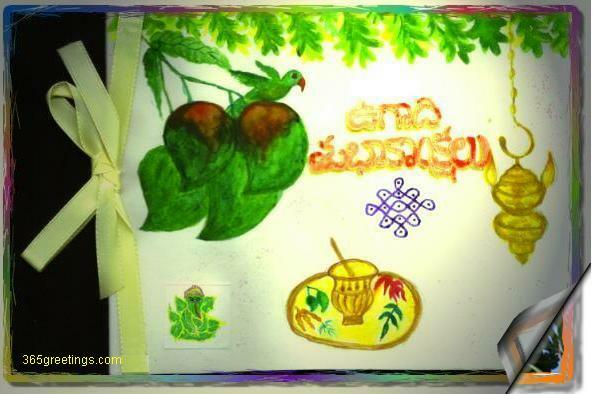 Ugadi celebrations are marked by literary discussions, poetry recitations and recognition of authors of literary works through awards and cultural programs. Recitals of classical Carnatic Music and dance are held in the evenings. The festival is called "Gudi Padwa" in Maharashtra; it heralds the advent of new year and is one of the most auspicious days for Maharashtrians. It is customary to erect Gudis on the first day (Padwa -A Marathi corruption of the original Sanskrit word Paadyami) of the Marathi New Year. `Gudi` is a bamboo staff with a colored silk cloth and a garlanded goblet atop it, which symbolizes victory or achievement. Hence, this day is known as Gudipadwa in Maharashtra. The New Year is ushered in with the worship of the "Gudi" and the distribution of a specific "Prasad" comprising tender neem leaves, gram-pulse and jaggery. The symbolism of tastes is the same as what is described above. Also in many Maharashtrian homes they celebrate the occasion by making Shrikhand Puri. Vasanta Navaratri (literally - The 9-night Spring festival) starts on this day and culminates nine days later on Sri Ramanavami which falls on Chaitra Sudhdha Navami.